Summary : It is often said that Lacan remarked that the Japanese are unanalysable, and in fact it is true that there are very few psychoanalysts and very little demand for analysis in Japan. I present here my reflections on this based on Lacan’s remarks about the Japanese language and the Joycean lalangue. C’est ce qui permet à la langue japonaise d’en colmater les formations si parfaitement que j’ai pu assister à la découverte par une Japonaise de ce que c’est qu’un mot d’esprit : une Japonaise adulte. [ That’s what enables the Japanese language to plug formations of the unconscious so perfectly that I was able to observe how a Japanese lady discovered what a Witz is — an adult Japanese lady ]. D’où se prouve que le mot d’esprit est au Japon la dimension même du discours le plus commun, et c’est pourquoi personne qui habite cette langue (*), n’a besoin d’être psychanalysé, sinon pour régulariser ses relations avec les machines-à-sous, — voire avec des clients plus simplement mécaniques. [ That proves that in Japan Witz is even the dimension of the commonest discourse, and that’s why no one who dwells in the Japanese language (*) has a need to be psychoanalysed if not in order to regularise his relations with coin machines or with more simply robotlike clients ]. (*) Lacan’s expression : « habiter le langage » [ to dwell in language ] refers to these phrases of Heidegger : “Die Sprache ist das Haus des Seins. In ihrer Behausung wohnt der Mensch” [ Language is house of Being. Man dwells in its housing ] (cf. Brief über den »Humanismus«). The Lacanian definition of human being is parlêtre, that is, “Being-in-language” who dwells in the structure of language. Because no one will ever undergo a psychoanalysis in order to normalise his relations with machines or robots, we can formulate this more simply : who dwells in the Japanese language has no need to be psychoanalysed. It is said that Lacan remarked that the Japanese are unanalysable as well as rich people, Catholics, the English people — and of course psychotics and perverts. We could say there is a slight difference of sense between saying it is unnecessary and saying it is impossible. However it is true that in Japan there have been, are and will be very few psychoanalysts (including Lacanians and non-Lacanians) and very little demand for psychoanalysis. It is absolutely certain that, as far as psychoanalysis is concerned, Japan has been, is and will remain the least developed country among the most developed and the most capitalistic countries in terms of political economy. Nevertheless I, as a Lacanian psychoanalyst practicing in Tokyo, can say that there are some whose mother tongue is Japanese, who speak Japanese and think in Japanese and who come to have psychoanalytic experience with me. So according to Lacan’s suggestions we might suppose something in the Japanese language which prevents Japanese in general from having the need or possibility of experiencing psychoanalysis, and which some exceptional Japanese who come to be analysed have been able to escape. What might it be ? This is the question which I try to answer in this essay. In all of the three texts mentioned above Lacan points out one particular factor — the prevalence of intra-linguistic translation in Japanese — of which he even says : “it is perpetual translation which became language” [ C’est la traduction perpétuelle faite langage ] (Autres écrits, p.20). And he correlates that factor with what he calls “duplicity” (the 11th February 1975, Seminar XXII) or “bifidity” (the 24th November 1975, at Yale University, Scilicet 6/7, p.36) comprised in the Japanese language because of the massive presence of Chinese characters and words in it. That remark of Lacan refers to the linguistic characteristics of Japanese as determined through its long history of relationships with China and in its modern relationships with Western countries. Linguistically the Japanese language is the main member of the Japonic language family, an isolated language family completely different in its derivation and in its linguistic structure from the Chinese language or from the Indo-European languages. Japanese was originally a non-literate language with a relatively small and simple vocabulary. In the 5th century CE it began to adopt Chinese characters and words for the purpose of introducing from China, one of the most developed countries in the ancient and medieval world, such civilizational elements as governmental and legal systems, specific knowledge and technique from various fields, the Buddhist sutras translated in Chinese and texts of ancient Chinese sages (Confucius, etc.). Because it was practically impossible to translate into the primitive Japanese so many complicated and sophisticated Chinese terminologies and concepts, the process of civilizational importation compelled the Japanese language to “speak Chinese in Japanese” (cf. Autres écrits, p.498), that is, the Japanese ruling class and governmental organs began to use in their language a multitude of untranslatable Chinese words as such, pronouncing them in Japanized way of pronunciation, that is, as far as Japanese who don’t speak Chinese can. That process of massive transplantation of Chinese characters and words with Chinese thinking and culture transformed radically the Japanese language in the period from the 5th century to the 9th century, which culminated in the development of the two systems of Japanese phonetic letters (hiragana and katakana) invented from Chinese characters. Then in the 19th century, when Japan began to massively adopt modern sciences and capitalism from Western civilization, a multitude of technical and abstract words and concepts were translated hastily from English, French, German, etc. not into properly Japanese words (because of lack of adequate vocabulary) but into neologistically formed words typically composed of two Chinese characters and, again, pronounced in a Japanized way of pronunciation. It was then a sort of Japanese snobbery to believe that intellectual concepts newly imported from the Western civilization should be expressed with Sinicised words, not with properly Japanese words. I could add a remark that it is due to the sexism inherent to the Japanese language where they believe that to use the properly Japanese words is feminine and even effeminate while men should use the Chinese or Sinicised words written with Chinese characters. Finally, since 1945, such a flood of American words has been introduced rapidly and continuously into Japanese society that they can no longer be translated at all and are only left to be pronounced in Japanized way of pronunciation and to be written as such in Japanized way of writing (katakana), that is, as far as Japanese who don’t speak English can. The actual Japanese language is a nightmarishly chaotic compound resulting from all those historical processes of civilizational and cultural importations of words and notions from Chinese and Western languages into the primitive Japanese with its grammatical structure basically unaltered through the course of its history. So when you speak Japanese your speech contains a lot of Chinese words and American words pronounced in a Japanized way of pronunciation which have no meaning per se in Japanese phrases, such that it seems that you speak like James Joyce in his Finnegans Wake. jusqu’à Finnegans Wake, Joyce respecta ce que Chomsky appelle la « structure grammaticale ». Mais, naturellement, il en a fait voir de dures aux mots anglais. Il alla jusqu’à injecter dans son propre genre d’anglais des mots appartenant à un grand nombre d’autres langues, y inclus le norvégien, et même certaines langues asiatiques. Il força les mots de la langue anglaise en les contraignant à admettre d’autres vocables, vocables qui ne sont pas du tout respectables, si je puis dire, pour quelqu’un qui use de l’anglais. [ even in Finnegans Wake Joyce respected what Chomsky calls “grammatical structure”. But of course he did something hard to English words. He even injected into his own genre of English those words which belong to a multitude of other languages including Norwegian and even some Asian languages. He forced words of the English language in that he compelled them to admit other vocabularies which are not respectable at all — if I can say — for someone who uses English ]. So we can say that to speak Japanese is comparable to speaking, so to say, Finneganian. In the Lacanian terminology we can say that the Japanese language is lalangue par excellence, even more lalinguistic than English which Lacan privileges when he calls it lalanglaise in his seminar on the 13th April 1976 (Séminaire XXIII Le sinthome, p.133). Well, what is lalangue ? Lacan introduced in his teaching the term lalangue combining in one word the definite article and the noun of la langue [ the tongue, the language ] in his Seminar XIX (1971-1972), that is, about 6 months after the text Lituraterre, to subsume in the concept of lalangue the concept of letter as material aspect of signifier. When a Lacanian psychoanalyst listens to his patient, to begin with, he hears some fragments of pure lalangue, that is, he hears the utterance as fragments of chain of vocal matters in their equivocality with no supposition of articulated phonemes, morphemes or semantemes, that is, with no supposition of meaning, without comprehension. And then — or at the same time — he reads with his ear (cf. 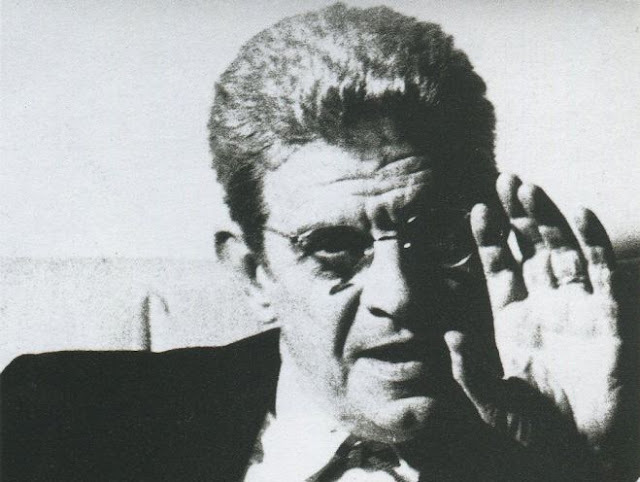 Lacan’s speech in Tokyo, the 21st April 1971) those fragments of lalangue to interpret them, not in function of their significance, but in function of the subject $ as unconscious desire. l’insu que sait de l’une-bévue s’aile à mourre [ unbeknown that knows of the one blunder wings himself to mora ] — l’insuccès de l’unbewusst c’est l’amour [ unsuccess of the unconscious is love ]. You might say those are Witz. Yes, Finneganian Witz. If Lacan says that “in Japan Witz is even the dimension of the commonest discourse”, that’s because, as I said, the Japanese language is comparable to Finneganian lalangue. And at the same time Lacan says that in the Japanese language the formations of the unconscious can be plugged so perfectly that he saw once an adult Japanese discover what a Witz is, that is, she didn’t know till then what Witz is as such because it had been covered and hidden completely to her. I call your attention to this point : if Lacan says “to plug the formations of the unconscious”, that means the formations of the unconscious are something susceptible to be plugged, that is, something like a hole. Le sujet, le sujet cartésien, est le présupposé de l’inconscient. L’Autre est la dimension exigée de ce que la parole s’affirme en vérité. L’inconscient est entre eux leur coupure en acte. To consider the unconscious as a hole or a gap implies not to consider it as something like an obscure force or energy repressed or oppressed in somewhere in the mind. Such mythological conception of the unconscious is alien to Lacan’s teaching. To think of a hole seriously Lacan first introduced in his teaching the topology of surface in his Seminar IX Identification (1961-1962), because the simplest way of thinking of a hole is to represent it as a hole open on a surface. Thus Lacan introduces in his teaching the topology of a closed surface called projective plane, alias cross-cap (cf. 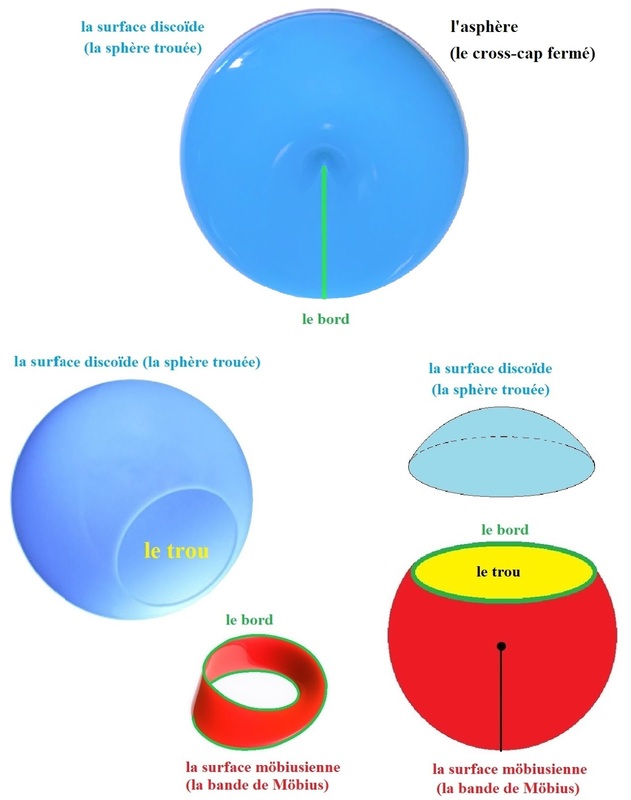 figure 2) and cuts it into two distinct surfaces (a holed sphere and a Möbius strip) so that we can have these four elements of the apophatico-ontological topology : the consistent surface of the holed sphere (blue), the ex-sistent surface of the Möbius strip (red), the hole (yellow) and its edge (green). green : the edge — the Real-Necessary (which doesn’t cease to be written in Wiederholungszwang). green : the edge — the place of other. In the apophatico-ontological topology of Lacan lalangue forms the edge of the hole of the Symbolic and the littoral (cf. Lituraterre) between the locus of consistency of the Imaginary and the locality of ex-sistence of the Real-Impossible. 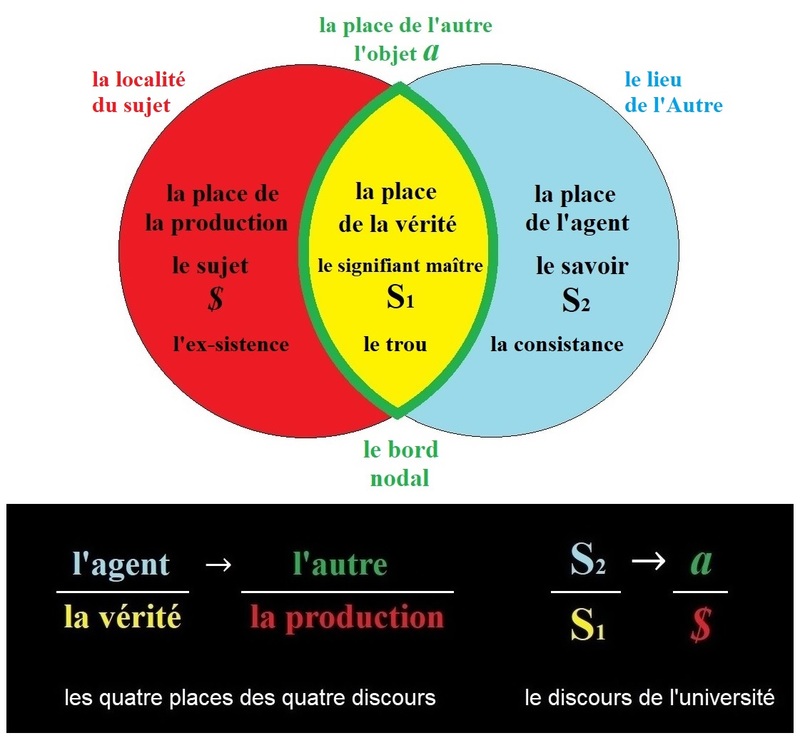 A fragment of lalangue is an object a in the place of other in the structure of the discourse of university, which corresponds to the edge of the hole of the Symbolic. This edge of the object a supports materially the hole so that the hole can present itself as a hole, and, as Lacan says sometimes so, the object a presents itself as a hole with its material consistency. 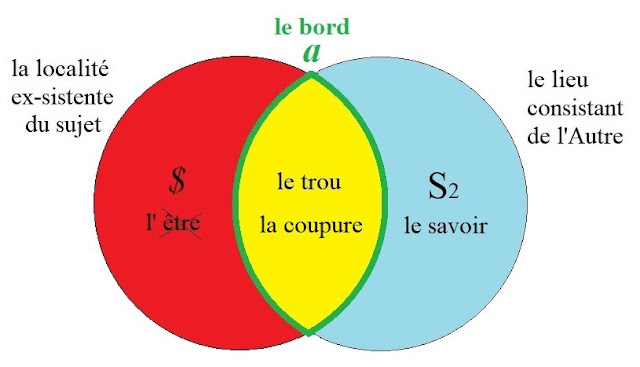 This object a as a hole with the edge (green) supporting it and representing the subject $ in the locality of ex-sistence (red) formalises the structure of the formation of the unconscious : a / $. And this hole is what can be plugged occasionally — how ? By two ways : 1) by the master signifier (signifiant maître) S1 in the place of truth in the structure of the discourse of university, which we could call also master significance (Herrenbedeutung, signifiance maître) ; 2) by lalangue itself as in the case of automatisme mental (imposed words) or in the case of the Finneganian lalangue. In dem Stück der Reisebilder, welches ›Die Bäder von Lucca‹ betitelt ist, führt H. Heine die köstliche Gestalt des Lotteriekollekteurs und Hühneraugenoperateurs Hirsch-Hyacinth aus Hamburg auf, der sich gegen den Dichter seiner Beziehungen zum reichen Baron Rothschild berhümt und zuletzt sagt : Und so wahr mir Gott alles Gute geben soll, Herr Doktor, ich saß neben Salomon Rothschild und er behandelte mich ganz wie seinesgleichen, ganz famillionär (*). (*) This Witz word famillionär is a condensation of familliär and Millionär. Lacan suggests us in which context we can hear it : the relationship of Heine with the father of the woman he loved, a wealthy man who refused the marriage of Heine and his daughter because of the poverty of the poet. When we hear this passage the words “ganz famillionär” strikes our ears as a Witz because of its strangeness and incomprehensiveness. This fragment of lalangue presents to us itself as a hole of nonsense — the hole vacated of the master significance S1 in the place of truth (yellow). A Witz can have its effect of plus-de-jouir (Mehrlust, more-lust) as far as its hole is free from the plug of master significance S1. If the master significance S1 is given in the place of truth, we don’t really notice the Witz as such, but we comprehend simply the normalised meaning of the word. The master signifier S1 supposed in the place of truth in the discourse of university as the structure of alienation formalises something metaphysically a priori, for example, as Heidegger enumerates in the history of Being (die Geschichte des Seyns), Platonic ἰδέα, ontological οὐσία (Being), scholastic essentia or substantia, God of philosophers and theologians (distinguished by Pascal from God of Abraham, Isaac and Jacob), epistemological transcendental ego, Nietzschean will to power, and we can add to them Freudian super-ego. The master signifier S1 as master significance plugs the hole or the gap of the unconscious (cf. figure 3) to hide the ex-sistent locality of the subject $ and to prevent the formations of the unconscious from having their effect of Mehrlust (plus-de-jouir). If the Japanese language is lalangue par excellence and fragments of lalangue are everywhere in Japanese phrases, the lalinguistic hole is plugged necessarily in advance by intra-linguistic translations giving to each fragment of lalangue its predetermined meaning, that is, the master significance S1 plugging the hole. So let’s see now what the intra-linguistic translation in the Japanese language is and how it functions. It’s the matter of what Lacan calls Japanese “duplicity” along with the English “bifidity”. Lacan points out that the Japanese “duplicity” is the effect of the duality of on-yomi and kun-yomi of Chinese characters. In principle each Chinese character in Japanese has an on-yomi and a kun-yomi (of course there are a lot of exceptional cases, for example a Chinese character can have more than one on-yomi or more than one kun-yomi, and there are characters without on-yomi or without kun-yomi in Japanese). On-yomi of a Chinese character is its Japanized pronunciation, while its kun-yomi is a meaning allotted to it and formulated in one simple properly Japanese word. For example the on-yomi of the Chinese character 人 (which means : man in the sense of ἄνθρωπος) is jin (its modern Chinese pronunciation is ren) while its kun-yomi is hito. In other words the on-yomi of a Chinese character is its lalinguistic side while its kun-yomi its significant side. Each Chinese character in Japanese can function as link between those two sides, and because their correspondence has been established historically, the link function of Chinese characters in the actual Japanese language is predetermined as a historical a priori. Thus Lacan might have believed that in the Japanese language the lalinguistic side can be aprioristically translated into the significant side by the link function of Chinese characters, so that no fragment of lalangue can be free from predetermined master significance and that every lalanguistic hole a is aprioristically plugged by a master significance S1. But we can say it’s not necessarily so in the dimension of particular fragments of Japanese lalangue, where equivoque can remain. For example, the phoneme sei in Japanized pronunciation can be the on-yomi of too many Chinese characters to be identified, and accordingly the corresponding kun-yomi cannot be determined univocally even if we take into consideration the context where it is uttered. When I say : “It is said in the Seisho that...”, this word Seisho made of that multivocal phoneme sei and the phoneme sho signifying in this case “writing” or “something written” can mean Holy Bible [聖書], Blue Book [青書] or any published book regarded as standards on the subject of a particular scientific domain [成書]. Another example is one I had in my everyday life. One day, when I proposed to my friend : “Shall we go to dine in the restaurant *** on the day of Seijin ?” with the intention of dining there on the Japanese national holiday called Seijin-no-hi (the day of Seijin [成人 which means : adult ]) consecrated for communal celebration of all the people in a community who are 20 years old, my friend asked me back : “you mean which saint ?” for he took the word Seijin in the meaning of holy man, that is, Catholic saint [聖人] (for both of us are Catholic). As everyone can presume his response had a strong Witz effect which made me laugh much. That example based on the equivoque of the lalinguistic fragment Seijin shows us clearly how a Mehrlust effect of Witz can be caused. The response of my friend : “Which saint ?”［どの聖人？ Dono Seijin ?］evacuates from the place of truth the supposed master significance S1 of the word Seijin［成人，adult］and thus brought it back to a state of pure lalangue. Then this lalinguistic fragment Seijin happens to function as a signifier a representing for another signifier S(Ⱥ) the subject $ : a / $ (cf. figure 3) which Lacan says is “the structure of all the formations of the unconscious” (Écrits, p.840). Nevertheless Lacan says that “the [ Japanese ] being-in-language can therefore be subtracted from artifices of the unconscious which don’t attain the Japanese being-in-language because they are closed to it” [ l’être parlant par là peut se soustraire aux artifices de l’inconscient qui ne l’atteignent pas de s’y fermer ] (Le séminaire XI, p.253) in the very same way as he says that “Joyce [ is ] unsubscribed to the unconscious” [ Joyce désabonné à l’inconscient ] (Le séminaire XXIII, p.164). That is very true as far as the actual Japanese language has almost the same structure as the Finneganian language. Lacan (Le séminaire XXIII, pp.95-97) suggests us that for Joyce words are more and more imposed to the extent that he writes finally Finnegans Wake where the language is dissolved, broken or decomposed to the state of pure lalangue, and that that has something to do with the schizophrenia of his daughter Lucia whom Joyce believes to be a real telepath. In other words the text of Finnegans Wake is equivalent to schizophrenic hallucination or hallucinosis of imposed voices (l’automatisme mental), and only the artistic creation prevents Joyce from being overtly psychotic. The words imposed to Joyce in their lalinguistic state cannot function as signifiers representing the subject $ because for Joyce as well as “for the schizophrenic patient, all the Symbolic is Real” (Écrits, p.392), that is, the purely lalinguistic object a in their words doesn’t form edge of the hole of the Symbolic but covers up completely the hole so that the subject $ is hidden instead of being represented. In the Japanese language also, generally speaking, fragments of lalangue can hardly function as signifiers representing the subject $, even if there can be occasional exceptions. And this unrepresentedness of the subject $ in Japanese is conditioning what Alexandre Kojève calls “the snobbism in pure state” [ le snobisme à l’état pur ] in Japan and what fascinates Roland Barthes who calls Japan “Empire of signs”. Because of the historically determined lalinguistic structure of the language it is very difficult to think in Japanese, as you can easily presume that to think in the Finneganian language is practically impossible. This difficulty or practical impossibility of thinking in Japanese is conditioning for example some unbelievable characteristics of education in Japan : pupils and students are not encouraged to think by themselves but only to assume what is imposed and dictated to them as absolute norms and traditional standards. If you cannot adapt yourself in that system you will be simply excluded from your local society or from Japanese society as a whole. It is no wonder that Japanese society has been, is and will remain fundamentally totalitarian under its semblance of representative democracy, as well as fundamentally sexist, misogynistic and phallocratic. Such impositions of norms have effected and are maintaining the predominance of master significance in the Japanese society. And that predominance of master significance which we must now call paranoiac is in fact the compensation for the impossibility of thinking in Japanese. We can say in general that the function of Mehrlust (plus-de-jouir) of the object a and the effect of phallic jouissance of the master signifier S1 in the structure of alienation (cf. figure 3) are competing against each other. We can observe the pure predominance of Mehrlust for example in the sexual perversions while the pure predominance of phallic jouissance is observable in the pure form of paranoia without phenomenon of automatisme mental. Most psychoanalytic patients (analysant in French) are neurotics serving two masters simultaneously, that is, dominated by both of the two types of jouissance, Mehrlust of the object a and phallic jouissance of the master signifier S1, functioning side by side and competing against each other. We can say in general that you come to psychoanalysis if your phallic jouissance is weak enough and your Mehrlust is not strong enough to compensate the insufficiency of your phallic jouissance, that is, if you are not paranoiac nor pervert. And we cannot help having the impression that now in Japan there are so many paranoiacs and so many perverts in the general population. What in Japanese prevents one who dwells in that language from having a need or a possibility of experiencing psychoanalysis ? A possible Lacanian answer is : its lalinguistic structure which disfavours a signifier representing for another signifier the subject and which favours the predominance of master significance. In actual Japanese society this conditions on one hand the prevalence of nationalistic paranoia, and on the other hand the prevalence of various sexual perversions which are so much various forms of acting out to escape from the suffocating effect of the predominance of master signifier. Most of my patients come to psychoanalysis because they are not capable of being sufficiently pervert nor paranoiac in those particularly Japanese ways. I only pray that more Japanese people may find the way of psychoanalytic sublimation to escape from those Japanese ways of paranoia and sexual perversions.